Clearly this print from 1854 by Toyokuni III is meant as a tribute to one of his major inspirations, Hanabusa Itchō (1652-1724). The whole image has been carved in such a way as to mimic the painter's brush. Even the carver's name in the lower right is presented in a wholly unconventional way. The Kunisada print that appears on this page does have a close model in the hanging scroll attributed to Itchō shown above. 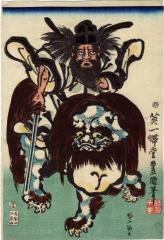 In both the woodblock print and the painting Shoki the Demon Queller is riding a lion that displays a rather dramatic and unruly mane. There is humor to be found in both examples. Kunisada was bothered by not being given the name Toyokuni II, after the death of his master Toyokuni I. That honor went to his master's son-in-law. "Disappointed at being passed over, Kunisada evidently decided to try something new. He began to study under Hanabusa Ikkei (1749-1844), fourth-generation head of the Hanabusa school. The name Kōchōrō, which Kunisada introduced into his signature in 1825, takes the character chō (butterfly) from Itchō, the name of the founder of the Hanabusa school." Quoted from: Kunisada's World by Sebastian Izzard, p. 127.